Jim Ottaviani's career in comics consists primarily of biographies of notable scientists of the 20th century. 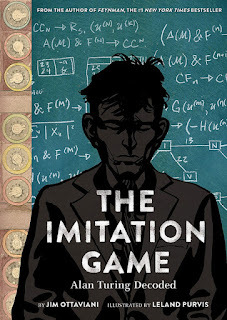 His most recent book is The Imitation Game: Alan Turing Decoded, which came out earlier this year, and was drawn by Leland Purvis. Turing was a mathematician and logician, and his work was used as the foundations of theoretical computer science and artificial intelligence. The book starts when Turing is a young boy, and showcases his early penchants for math, logic, and running (sometimes a combination of them at the same time). But it also starts to show his social awkwardness and stutter early on as well. As these were somewhat themes throughout his life (not necessarily the stutter per se, but the deliberate, often self-imposed isolation from others) it of course makes sense to introduce them in the early pages. Ottaviani proceeds to spend about 60 pages on Turing's youth and schooling before he's drafted (after a fashion) into working for the British government. There's another 100 or so pages on his work during the war, with the last 60-ish pages devoted back to his teaching and formal social ostracization. Interestingly, most of the personal life is left off in the middle section and we see him primarily in a work environment. I suspect this was done for two reasons: A) because many people in England during the war focused so intently on their work that they had little time for not trying to defeat Hitler, and B) many of of Turing's greatest strides and theoretical advances occur during this period. We certainly see Turing's personality and habitual quirks throughout, but his personal life -- which had already been set up as somewhat removed from "normal" society -- is largely set aside until he returns to academia. The book has a somewhat different structural set-up. While the primary story follows along Turing's life in a fairly typical linear fashion, it's narrated by a variety of people from his life who are being interviewed about him many years after his death. 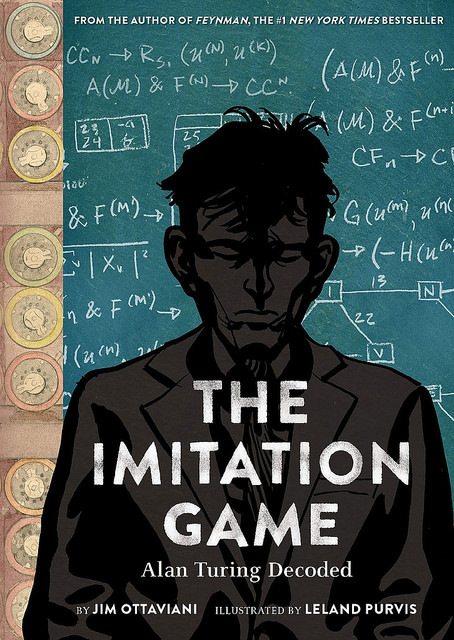 Going somewhat against convention, Turing's story is told in full color, but the short sequences showing these various interviewees are in black and white. Normally, one would use black and white to represent the older work, trying to mimic the technological advances of film. Here, the reverse is done -- successfully -- to put greater emphasis on Turing himself. The narrators simply provide additional details and interpretations that we wouldn't get from Turing's point of view. As with any of Ottaviani's comics, I find a lot to recommend here. It's very well-researched with a note-worthy bibliography, but unlike a lot of comic biographies, Ottaviani is able to infuse a lot of his subject's personality into his works so they don't come across as the visual version of a bland history textbook. Turing is a complex and compassionate individual, and while some of his social issues kept his own friends and acquaintances a little at arm's length, readers are able to see an intimate portrait of the man here. Now, why would I put this review under my "On -isms" label? Because Turing was gay. He spent most of his life in the closet, since homosexuality was a crime in England at the time, and was outed publicly in 1953. The problems (both legal and social) it caused him gave him so much distress that he committed suicide the following year. But here's the thing as it relates to the book. Aside from the public court trial and the repercussions of that towards the end of the book, Turing's sexual orientation is barely hinted at throughout the rest of the book. And that's noteworthy because, frankly, that's how it should be approached. I don't mean to say that homosexuality should be swept under the rug but, while it was part of who Turing was, that wasn't a large part of his own identity for much of his life. Because of his social awkwardness, he didn't have these grand flings or anything. He was just a guy interested in math and logic who happened to prefer the company of other men. And that's how Ottaviani approaches it here. It doesn't really become a plot point until he's dragged into court for it. Comics talking about sexuality and gender identity are great. I have any number of books on my shelves that are, in some way, autobiographies of people along the LGBTQ spectrum. Being friends with and having spoken to even more gay/lesbian/transgender folks, I know coming to terms with their identity in a society that has actively discouraged that for generations is liberating. So metaphorically shouting their stories from the rooftops via their comics makes sense, and it's great for a cishetero guy like me to help me understand what they've gone through. But that wasn't Turing. He was gay, but that was just a statement of fact to him. His identity was more wrapped up in his work. And this biography reflects that. And that's one of the things I like about where comics are going. Where you can have a gay character, and his sexuality is just part of his character, not all of it. I think other writers would do well to study that idea and mimic it.